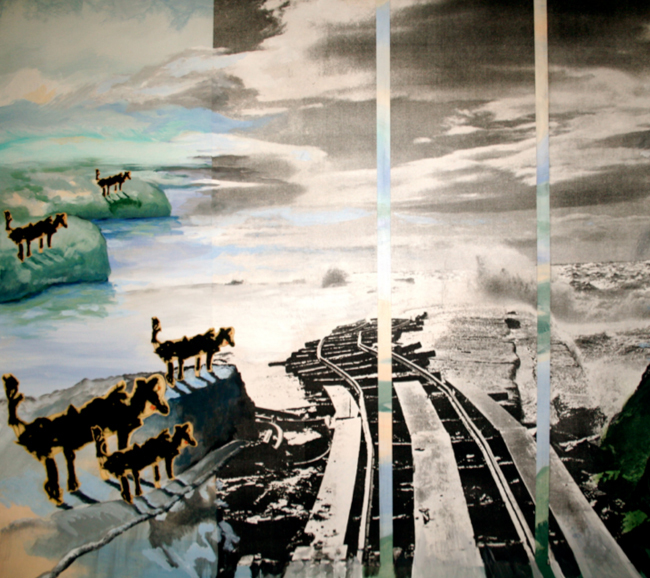 “Dream Dogs 1” began as an image from recurring childhood dreams of crossing rickety bridges over big seas. In this image five dogs gaze out toward a collapsing train bridge. The original dog image was made when I was a very young girl, drawn on manila paper, with black yarn glued on for fur. It was saved by my mother and surfaced a while ago. I made several copies of it, varying the sizes to create the group here. In the progression of the two images I see a correlation between inner and outer realms. The inner, reflected by a build-up of images gone awry due to the effects of accumulated unchecked angst and depression, and the outer world where the “runaway train” effect of unchecked destruction is destroying the natural world. 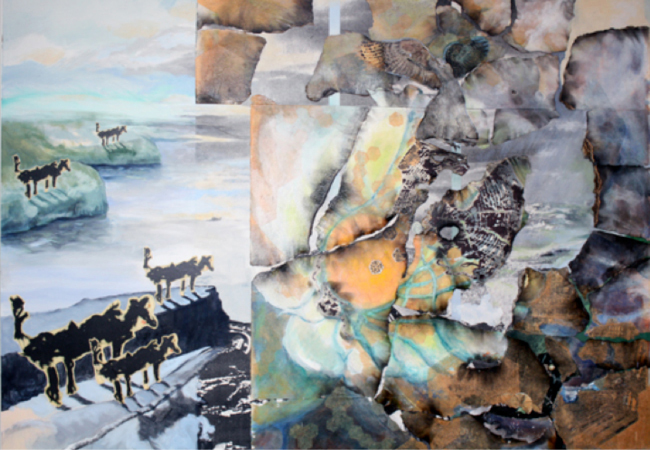 Susan Bradley - As a graduate student at The Hartford Art School, University of Hartford, Suan focused on ideas and imagery inspired by the hive and the honeybee. Using a variety of methods and materials she continues to explore this rich topic steeped in ancient history, mythology and spirituality. Her life and work continue to be influenced by the bee and a heightened awareness of the interconnectedness of all.